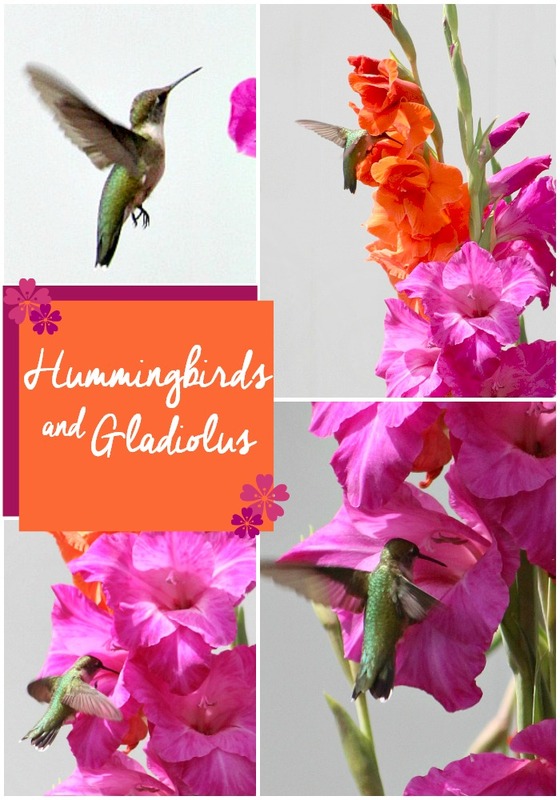 Planting spring bulbs produced gorgeous gladiolus in the garden and to my surprise, their bright colors attracted hummingbirds. 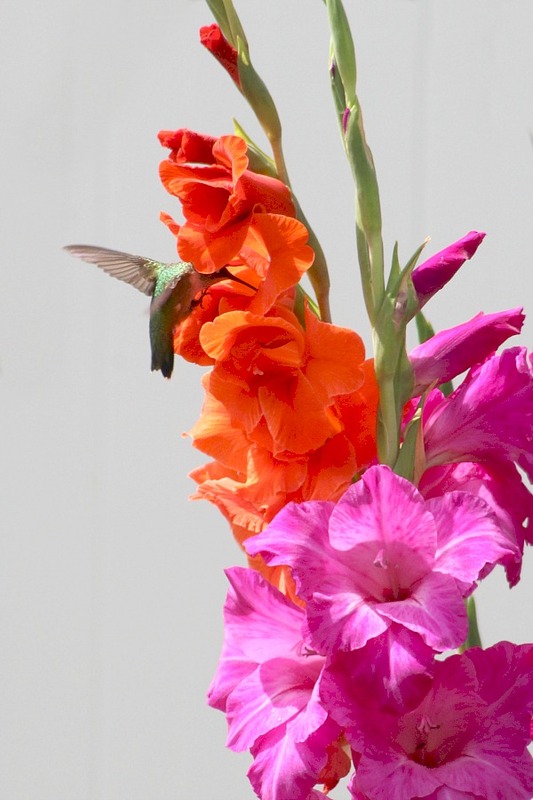 It is a lovely combination of hummingbirds and gladiolus right outside my window. I have a small raised bed herb garden on the side of the house. On one end I like to leave space for flowers. I have grown lovely zinnias and morning glory in the past and I loved them. This spring I planted gladiolus bulbs. It has been years since I have grown glads. They are bright and beautiful. And much to my delight hummingbirds think so too. 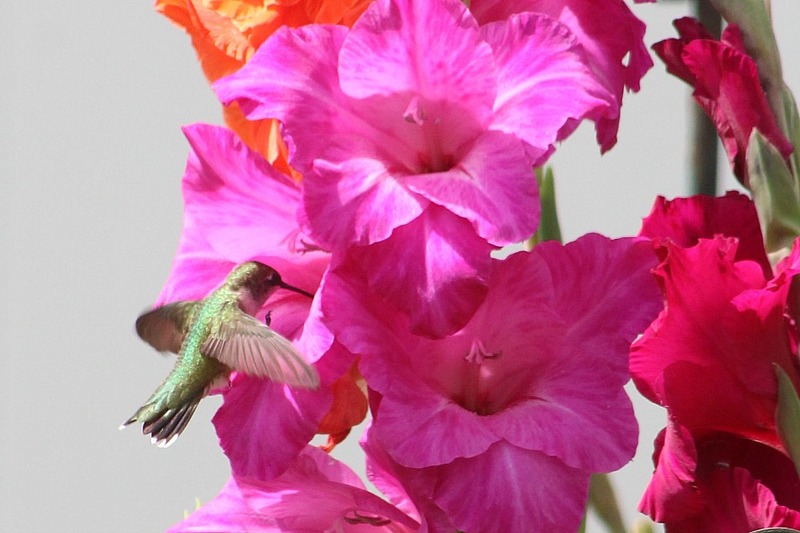 Hummingbirds are small, colorful birds with iridescent feathers. Their name comes from the fact that they flap their wings so fast (about 80 times per second) that they make a humming noise. They can fly right, left, up, down, backwards, and even upside down. 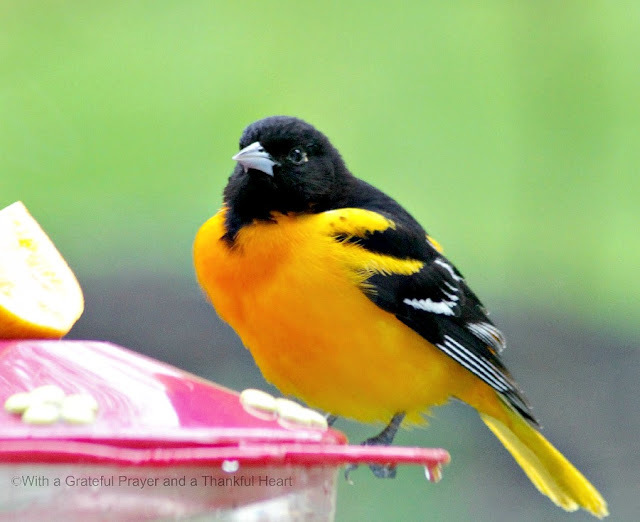 They are also able to hover by flapping their wings in a figure-8 pattern. Hummingbirds have a specialized long and tapered bill that is used to obtain nectar from the center of long, tubular flowers. The hummingbird’s feet are used for perching only, and are not used for hopping or walking. 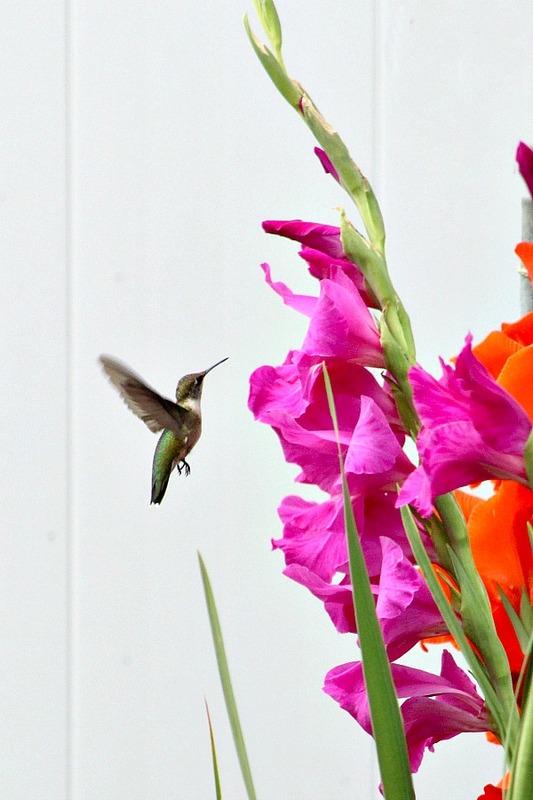 Hummingbirds primarily eat flower nectar, tree sap, insects and pollen but they also frequent feeders. 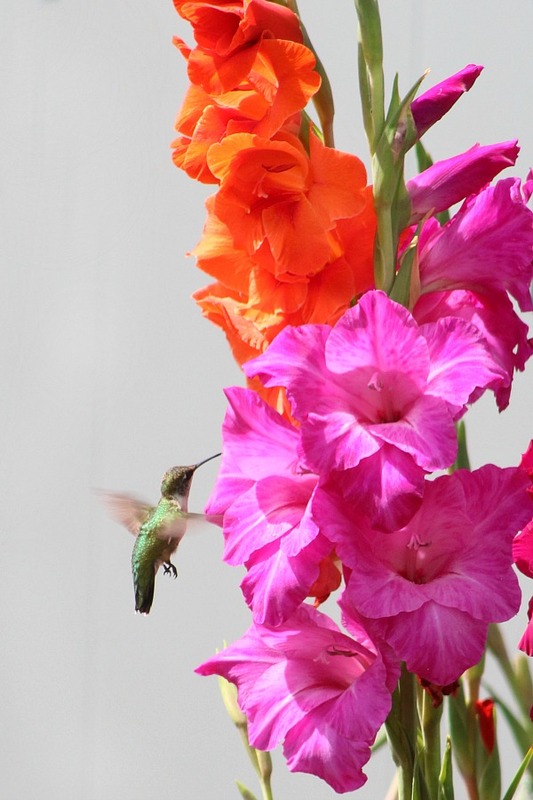 Learn how easy it is to make your own nectar and attract hummers to them by clicking hummingbird nectar. Gladiolus flowers bloom on a long spike that ranges from 2 to 4 feet tall. The flowers open from the bottom and work their way upwards creating a long spire of blooms. The grass-like foliage resembles the blade of a sword giving these flowers a reputation as sword flowers. The blooms range in color from bold orange, fuschia and red like I have in my garden to pastel blues, pinks and yellows with many outstanding bi-colors variations. 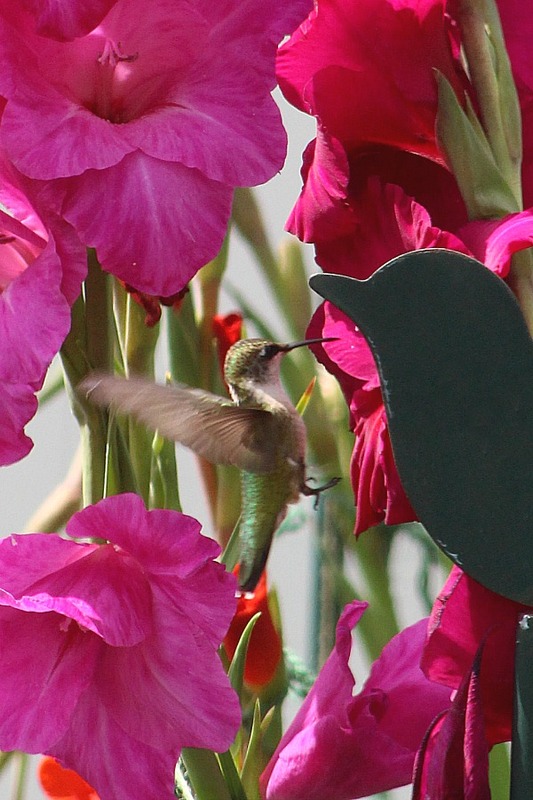 From the dining room window is where I first notice the hummers visits to the glads. I’ve had yellow gladiolas in my yard since we moved here. I always enjoy them but haven’t yet seen a hummingbird come near. They are too busy in my backyard and the glads are in the front. Perhaps they sneak up that way when I’m not looking! 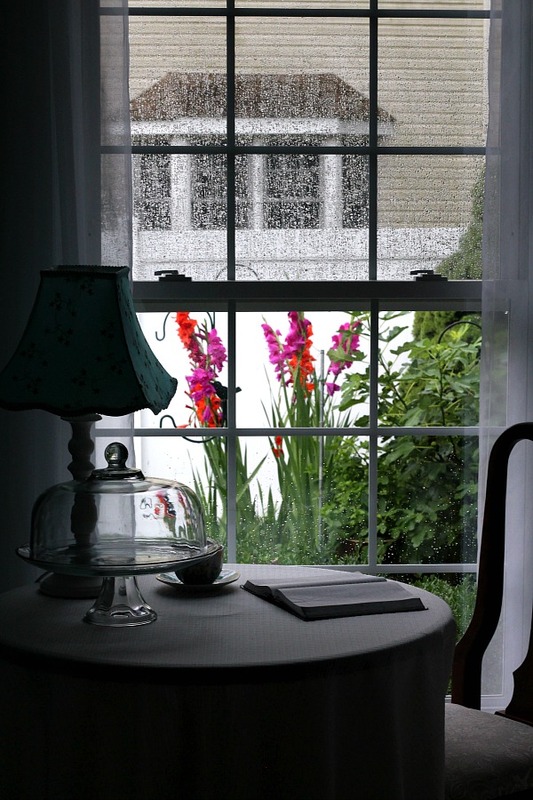 I remember when my mother planted gladiolus. Hers for some reason were always laying down. Yours are so pretty and what an added bonus for them to attract the hummingbirds.